Major newspapers and magazines showered superlatives and described Manjunath & Nagaraj as brilliant violinists par excellence. Vidyapith news letter, NY - ....'One of the great advantages of attending classical Indian music concerts in the United States is the accessibility of top artists. 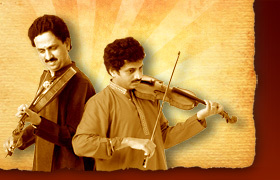 Rather than being far away from the artists in India , organizations such as the Vidyapith are blessed to be able to host top artists like Mysore Nagaraj and Mysore Manjunath on premises and provide a truly unique experience to music lovers in the area'.